(Emily Zanotti – Daily Wire) On Saturday, a video went viral, seemingly showing a group of Catholic high school students confronting and harassing a Native American protester who appeared to be peacefully playing a drum, but by Saturday night it was clear the confrontation wasn’t the end of the story. 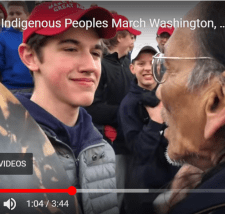 The three-minute video was posted online by a group of Native American protesters who claimed they were harassed and intimidated by a group of Covington Catholic High School students waiting for their bus near the Lincoln Memorial. The video is heavily clipped at the beginning and end, and shows only an apparent “confrontation” between a protester named Nathan Phillips and a Make America Great Again-hat wearing teen.